Physicists previously detected anomalous readings in the decay of a B meson, which may mean the existence of physics beyond the current theory. The Standard Model, which emerged in the 1970s, is a theoretical foundation that explains the world and matter at the very smallest levels of reality: elementary particles so minute they boggle the imagination and defy easy understanding. It has been a pretty successful description so far, but like most old foundations, it’s beginning to show signs of cracks and disrepair. Of course, it’s not so much that the standard model is wrong; rather, there may be a deeper kind of physics, a dark sector that we haven’t been able to reach yet. In other words, there are hints of something greater and even more fundamental shining through those cracks like glinting rays of sunshine. And a team of physicists from the Institute of Nuclear Physics of the Polish Academy of Sciences (IFJ PAN), working with the LHC particle accelerator at CERN, think they may be on the track of what that “something” is. Briefly, the Standard Model divides matter and the forces of the universe into several categories of elementary particles. Pay attention now, reader, because this will go quickly. Bosons transmit force; photons (light) emerge from electromagnetic activity; eight species of gluon are involved in the strong nuclear force (holding atoms together); and the W+, W- and Z0 bosons oversee the weak nuclear force (responsible for radioactive decay). Matter comprises fermions, which are formed by quarks and leptons; there are six species of quarks, and six of leptons (which include electrons and neutrinos), together with 12 antiparticles for each. The Higgs boson provides mass for all, save the gluons and photons. But here’s the problem—the Standard Model, in common with other theories explaining the universe (such as Quantum Mechanics and General Relativity), is not quite as comprehensive as we’d like it to be. It fails to explain some of the most interesting and pressing questions confronting physics. For instance, it doesn’t account for the division of fermions into different families, or why matter achieved the upper hand over antimatter in the early universe. And if dark matter is indeed an actual form of “matter,” it is not explained by our current understanding of elementary particles. Perhaps most importantly, gravity (that most mysterious and fundamental of forces) is utterly unaccounted for by the Standard Model. The Large Hadron Collider has turned its considerable particle-smashing heft to the task of seeking out new elementary particles beyond the Standard Model; but it’s possible they exist just outside the energy limit of the LHC. If this is the case, then the only way to discover their presence will be to discern their “shadow,” as it were—the influence they exert upon other particles at lower energies. And one way this might work is if they cause “mesons”—unstable, short-lived combinations of a quark and antiquark—to decay in unusual and unexpected ways. This is what the team believes it may have found. A few years back, the LHCb experiment, which probes the mysteries of matter and antimatter, detected anomalous readings in the decay of a B meson or “beauty” meson—a meson consisting of a light quark and a heavy beauty antiquark. It was necessary to rig up a more accurate method of determining the parameters by which the beauty quark decayed in order to test its deviation from the Standard Model; the Polish team devised a means to determine the parameters independently. By more accurately determining the degree of deviation from the Standard Model, scientists will be able to ascertain whether the anomaly really represents the influence of unknown elementary particles beyond the Model, or whether it is merely some hitherto undiscovered property which the Model does account for. For now, physicists hypothesize that there is something called a “Z-prime” (Z’) boson, which mediates the decay of B mesons. 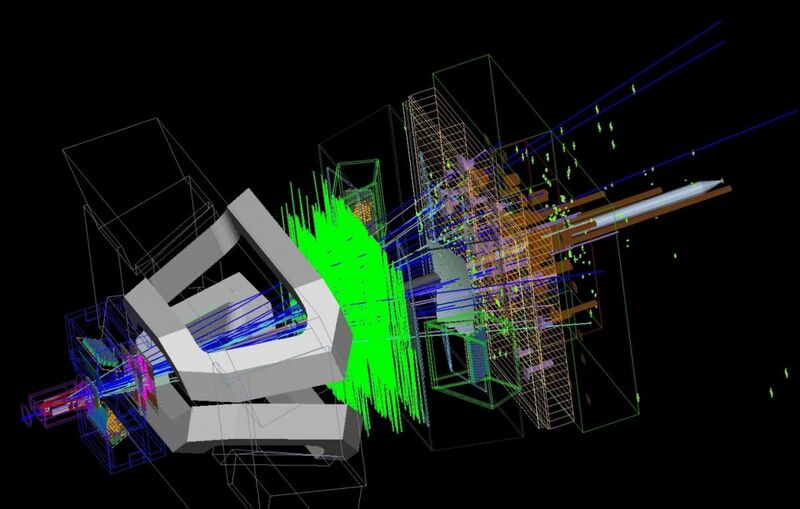 The LHC is gearing up now for new, higher-energy collisions. Perhaps, at last, they’ll discover the new particles, and the new physics, they’ve been searching for.